Supporting the growth of businesses, the economy, and the community in Palm Bay, FL. 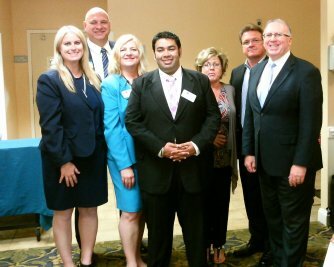 The Greater Palm Bay Chamber of Commerce is a valuable source of support, information, and resources for businesses in the Palm Bay area. We proudly provide our members with an array of services, such as business networking, advertising, events, and other business support assistance. The Chamber works hard to grow businesses and the local economy by bringing more companies, more products, more customers, and more jobs to the Palm Bay area. Through a collaborated effort with our members, we support the economic growth of all South Brevard communities and businesses. Whether you are an established business, new to the city, or just passing through, we are happy to provide you with the support and information you need to succeed. Located at the south end of the Space Coast, Palm Bay, Florida offers beautiful sunny days and small-town charm. It is the perfect place to raise your family and grow your business. Palm Bay is an ideal area for getting outside and having fun. Golfing, swimming, kayaking, fishing, and hiking, only to name a few, are activities that can be enjoyed all year long. Close to Kennedy Space Center and Brevard Zoo, there are plenty of cultural and educational attractions nearby. With Orlando only a short drive away and Melbourne right next door, there are an array of opportunities for work, school, and shopping. There is something for everyone in Palm Bay! Learn more about Palm Bay, Florida. We are proud to support our local businesses with valuable membership benefits. Our Chamber executives act as our member's advocates on business issues, such as economic development, crime prevention, and tax policy. We offer our members classes that will help them succeed in business, such as marketing, taxes, and other business related topics. Chamber members benefit from our Membership Luncheon, Business After Business Mingles and many other opportunities due to camaraderie between fellow members. Members receive a valuable advertising package to "kick start" their marketing plan, including discounts from media partners, e-Newsletter mentions, tabletop display, and much more. Businesses can gain huge exposure when they sponsor one of our signature events. Check out our list of Sponsorship Opportunities. The Chamber guarantees that you will benefit from membership if you attend at least two Chamber events in a 90-day period. If you do not benefit, your membership fee is refunded to you. Invest in your future and join today!